Whenever you are looking to turn down a job offer, it is best to communicate your plans in writing than verbally. Sometimes it’s also best to decline when the compensation is low, or the location is inconvenient, or it isn’t just the right profile for you to move forward with. 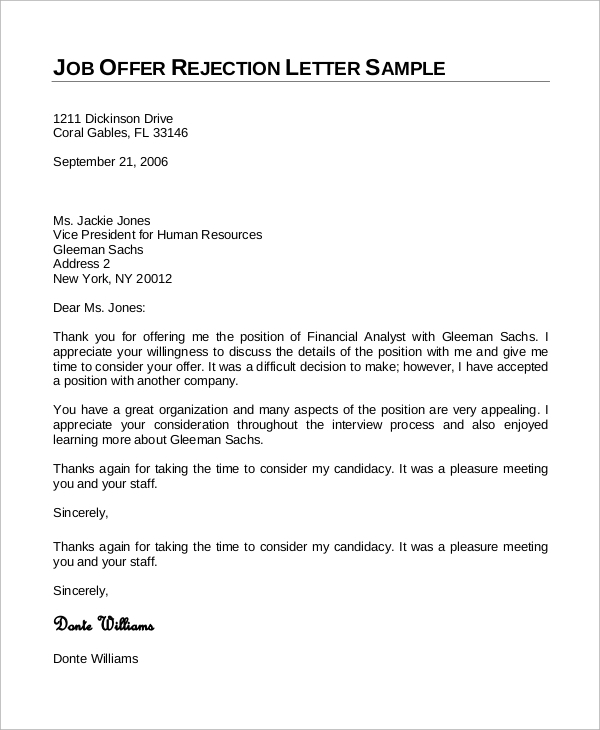 Job Rejection Letter Samples allows you to be prompt, courteous, diplomatic and concise. 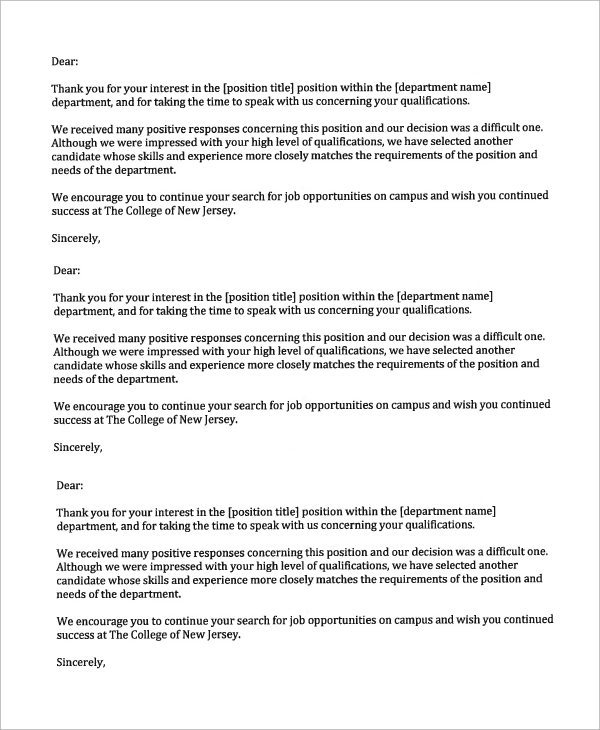 Here are some samples that show how to come best up with a job rejection letter. As the economy booms, there are high chances that a qualified candidate is approached by a company for certain positions. 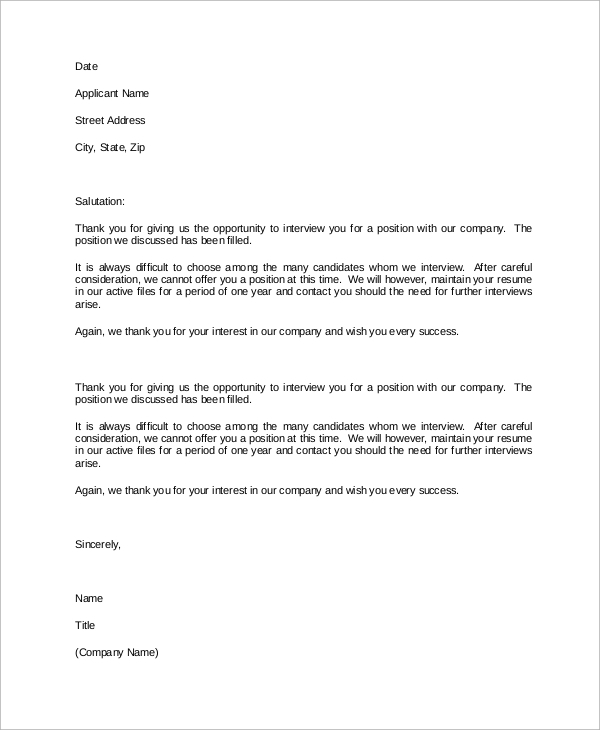 However, if you don’t find the job a good match for your profile or have other plans for your career ahead, here’s the best way to decline such offers. 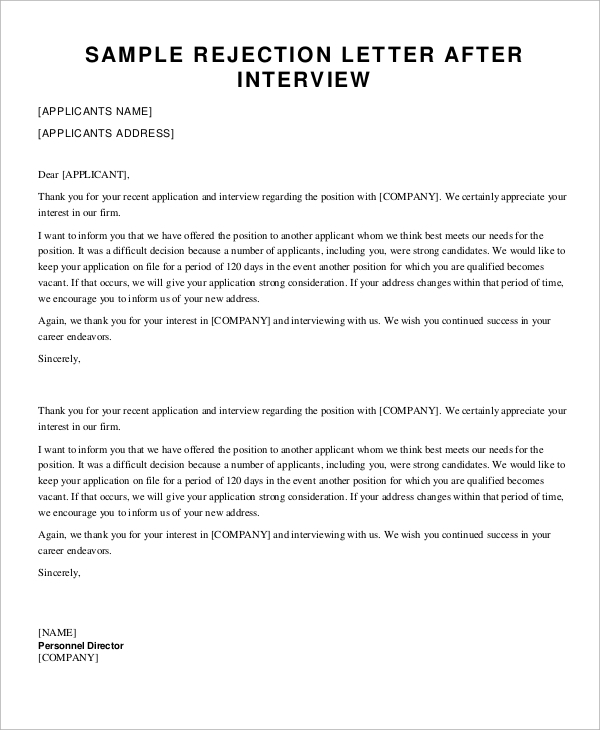 Job application rejection letters are applicable when you have already participated in the interviews and have been selected for the position. Whatever be the reason for your decline, it is best to come up with a courteous letter like this. You can also see the Complaint Letters. Any candidate looking for a job would be attending several interviews in different companies. If it comes to choosing between two positions you have been selected, it is best to let the employer know of your choice. Here’s how to go about it. 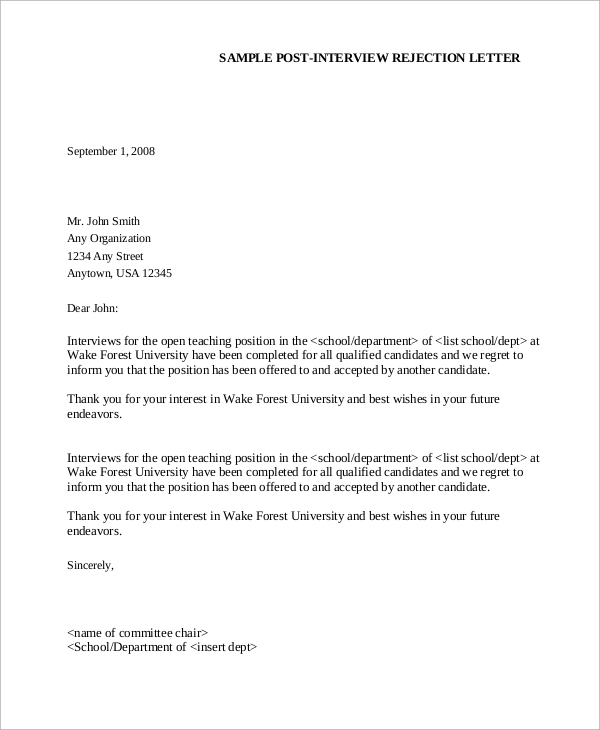 When do write a Job Rejection Letter? 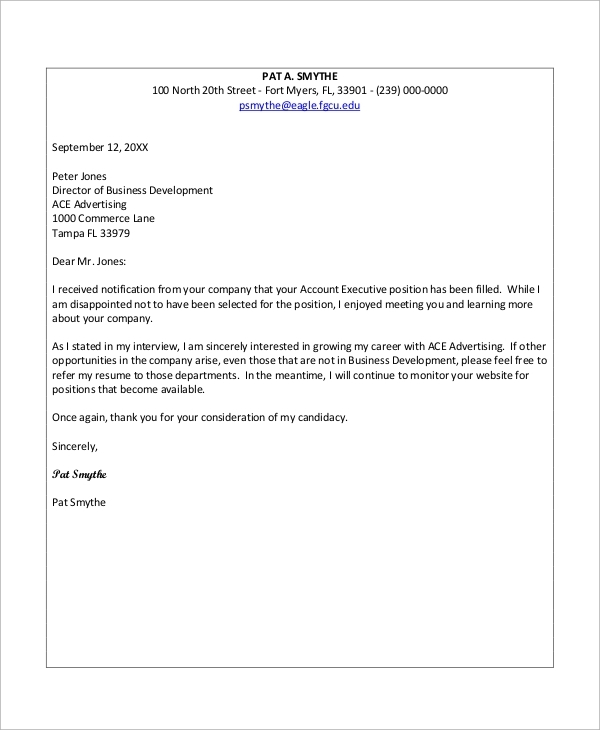 A Sample Job Rejection Letter was an acceptable application when a particular position wasn’t a good fit for your career and professional goals. While you can always communicate your plans over emails and phone, it is best to write a courteous letter stating the reasons. To be polite, it is best to mention that you were impressed by the company, but the particular position you were offered wasn’t a right fit. Sometimes, it is also about the expected pay. A rejection letter conveys your message but is ready that you might be offered a chance of negotiation in the later case. If you plan to join a different company, it is also best to mention it as a hint to the employer to look for your replacement. 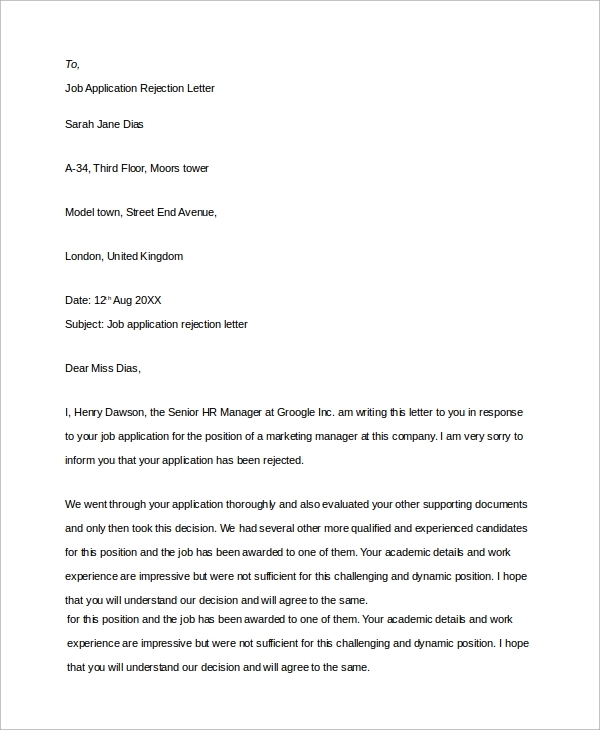 A job rejection appeal is written when all the formalities of the selection have already been completed, but you have a change of plans for your career. It could be a better position you got somewhere else or something about the position that doesn’t fit. Here’s a letter template to follow. Rejecting a job after you have been selected for a position can be a difficult job. There’s no good way to convey your plans, but it’s best to come up with a letter. It should be about thanking the company for selecting you as an employee and also stating a diplomatic reason for your decline. What shouldn’t be Written in a Job Rejection Letter? There could be several reasons why a particular position was unappealing to you. It could be the culture of a company, its products or services, your supervisors, its employee policies, the working hours, or any criticism you confronted from a member of staff. However, these will also be the things you shouldn’t be mentioning in the rejection letter as it indicates a negative attitude. Go for reasons that are understandable like the location of the office, the salary, or your selection into better positions elsewhere. Recruiters always like to end a relationship on a positive note. You can also see the Refusal Letter Samples. 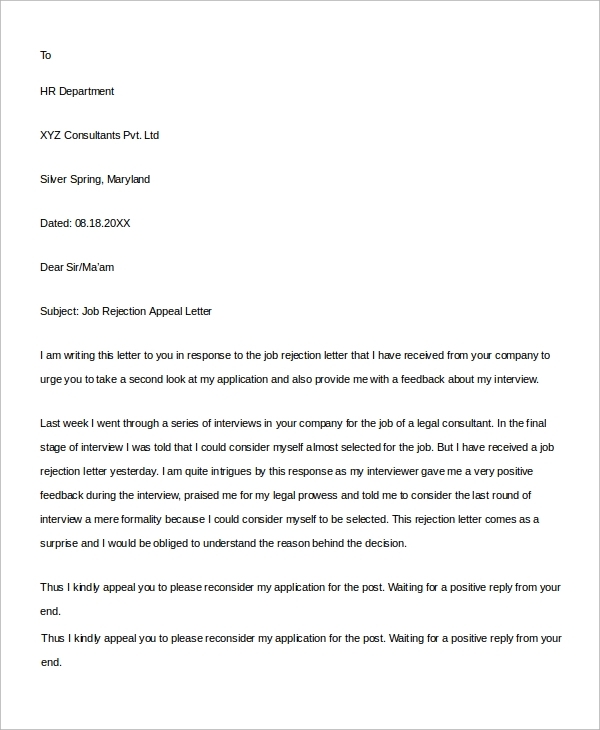 The above Cover Letters Examples for Job rejection are just sampled and are aimed to act as a guideline for your letter. They are just instructions and samples that instruct the expected tone of communication in such letters.